Maiden Voyage ~ so to speak! Two years ago this month, a group of rug hookers and a few husbands (including mine) went to England with Barbara Carroll, to take classes from Heather Ritchie and Cilla Cameron! The pattern was a proddy sheep taught by Cilla and the rock wall background was taught by Heather! One of our rug hookers, Keith Kemmer, designed this rug with vignettes of places that were memorable ~ it was available thru Barb only to those who went on the trip. I ordered one just in case I might sometime, in my golden years, might possibly want to do this rug ~ but it really wasn't my intention to ever do it ~ it was too big, too complicated, etc. etc. etc.!!! Then last fall, a friend asked me to join her group for a 3-day mini at Barb's studio in Ligonier, Pa. and I thought "A-HA" ~ this is the time to do this rug and avail myself of Barb's expertise ~ I truly would not have known where to begin! Voila!!! Here is my finished rug and I am so proud of it ~ for me, it's a huge accomplishment!! From left to right the vignettes are: Grinton Lodge - where many people stayed and we took the classes; Durham Cathedral (part of a Harry Potter movie was filmed inside the courtyard); the Shambles at York; the brick cottages at Beamish (a re-created old town); and my interpretation of the Buck Hotel and Pub, where we stayed along with our friends Danese & Ted !! On top of the cottages is a purple proddy sheep made with the leftover wool from the one I proddied. The borders are the fields surrounding the town of Reeth and are interspersed with rock wall fences, yellow canola fields, purple fields of heather, and fields of bluebells! Many of us purchased Wensleydale fleece curls and I used those for the sheep that run around the border! Up in the top left are the stone buildings of Reeth and a red-headed Heather toiling over her dye pots!! This rug means so much to me in terms of the memories and the labor of love that hooking this rug became for me! I am so greatful to Keith for designing it and so glad I had the foresight to purchase it, even though it wasn't my plan to tackle such a big project ~ it's 30 x 70, if memory serves me correctly ~ that's a big rug!! One thing I learned in terms of hooking a big rug, is not to leave it on the frame between hooking sessions!! As the rug grew, the weight of it caused it to stretch and get quite humpy in the middle ~ then I realized it had to come off the frame and 'rest' until the next time!! Fortunately, with careful steaming, it really flattened out nicely ~ my husband just built a stretcher frame to mount it and it will have a proper hanging place over a large square archway into the living room. That might even happen this weekend! I do wish that I would have kept a log of hooking hours and it would have been a great rug to blog about but ~ I didn't have a blog then!! I have no idea how many hours went into it but I started it in November and finished it in April before I went to Barb's for our spring getaway! One thing I must add is that being with Heather, who organized many wonderful day trips for us and being in her darling little studio, and Cilla, who added her own charm to our trip, and spending a week in the town of Reeth, was an experience I wouldn't have missed for anything! Heather is in California now to teach ~ I'm sure her students will just be thrilled to learn from her!!!! I hope I haven't gone on too long ~ my friends tell me my blog sounds just like I talk!!! I just really wanted to share the story behind the project! Next time, I'll post a picture of the class project ~ the Reeth Sheep rug!!! Thanks for stopping by!! This is my birthday boy and his son last night out on our deck! Dinner was really good ~ I can cook if I put my mind to it ~ and they won their first Little League game!! Luke doesn't look as tickled as he really was ~ he did a great job and the whole team really did well! I got a little Catfish hooking in late last night ~ still struggling with the color placement but it's moving along! I tried to add a picture but it placed it on top of the boys/ picture. I need to figure out how to place the pix through out the post ~ help! anybody who knows how to do that!!! I'm off to plant in the garden!! This past weekend, I did find some time to hook in between all the fun! When my friends and husband were 'rock sitting', I had been inside hooking for a while ~ I can only take so much sun. Actually, I sneaked out there and took their picture ~ only one of the fella's seemed to see me do that and asked what I was going to do with the picture ~ I told him!! So ~ all of the bluegreen water got finished and last night I started back on the fish scales. That is so time consuming due to placing colors and getting the right ones next to each other. When Barbara Carroll and I were color planning the scales, we first picked 5 or 6 colors ~ it didn't take a lot of hooking to figure out that was not enough, so we added more colors to make 8. As I hooked last night, it just seemed that it was so hard to keep like colors away from each other, that I added yet 3 more ~ I didn't really want to do that mid-stream, but I think they are similar enough that it won't be so noticeable but yet give more variation. By the time i hooked some of those in and was really on a roll, it was almost 11:30 and I had to give up ~ hopefully, there will be some time later this evening to tackle it again! Today is my youngest son's 39th birthday ~ EEEEE GADDD!! His little boy has his first Little League game of the season tonite (Daddy is coach) and then they will all come to dinner here ~ I think we'll have stuffed pork chops and maybe a Birthday Pie! I better get cracking!! That sounds like something an old person would say!!! This is one way we spend our time on Lake Erie ~ doing what we call 'sitting on the rocks'! There are four couples of us that have great fun but one of our group was in Cancun, so there were just three. We did have a fun trip over to Put-in-Bay on the Jet Express ~ had a nice walk out to the winery but on the way back into town, I got tired of walking, so my husband and I hailed a ride on a golf cart, driven by a nice young couple!! We gave them a tip for their efforts ~ they were very fun and quite accomodating!! We were able to be at the lake from Thursday thru Monday and went out for a lovely dinner one evening, breakfast at a local biker bar, grilled out another evening and yesterday we had everyone for a nice brunch that included mimosas and bloody mary's provided by the neighbors! A great time was had by all !! Now, back to reality!! Thought you might like to see pictures as you enter our garden gate ~ I love the garden at this time of year!! Although it seem's to me that I don't have much progress to report, I am posting what I hooked on Tuesday night ~ late ~ as I watched the Letterman show. The bluegreen area on top of the Catfish with the unfinished area in the middle, took me about an hour and that included cutting. At the first hooking camp I went to, I proceeded to cut up all the wool they gave me and the teacher shrieked when she came by and saw what I was up to!! It makes me laugh when I think about it ~ but now I cut as I go, even though it seems like it slows the process. We're leaving for our place on Lake Erie this afternoon and instead of packing, I'm posting!! Mr. Catfish will go along and I hope to get some hooking time in. We have so much fun up there with all our 'lake friends' ~ it's like being in college ~ although I didn't do that, it's my perception of that much fun! Yesterday, an old high school friend who lives in Oregon, came for a visit ~ she looks wonderful and I am proud to call her friend!! She spent the last year dealing with breast cancer and her humor and attitude has put her on the road to recovery ~ she could be the poster child for tackling this head on and then moving on!! Her sister-in-law came along and we had a great day! The only thing about our visit that made me crazy was ~ I thought they were coming today, Thursday!!! When she called on Tuesday for directions for Weds., I was a little rattled ~ but thanks to my wonderful friend/cleaning lady, who came on an emergency call and the fact that being crunched for time, brings out the best in me ~ we whipped this house into shape and I got some potted flowers set out for color and my wool room straightened up and served them a tasty little brunch!! When they left, Grandpa and I went to a kindergarten concert,then I hopped in the car and drove 50 miles to plant flowers on my parents graves for Memorial Day and was home by 6 p.m.!!! That would be a typical Day In the Life ~ ~ ~ . If my dear friend, Randi, is reading this ~ I hope you don't mind my sharing ~ I love you, Friend!!! The Garage Sale is over and it went really well!! I made an amount of money that more than rewarded my efforts and put a lot of that 'good stuff' in the hands of someone who really wanted it ~ what more could a girl ask for!! Now, we'll put a couple of things at the end of the drive with the 'free' sign on them and find a good place for the rest ~ sadly, some may end up in the trash but I promised 'his honor' (my husband's not a judge, but it makes feel really good when I call him that!) that this stuff wouldn't end up back in the basement! Of course, the things left from my last year's folk art shows will go back into my stock ~ of course! Included in this post is a picture of Miss Luci and her BoBo (that's me) at her first dance recital, last evening! We think she was the cutest little chicken on the stage! What a wonderful production put on by our local arts academy ~ we just can't say enough about how good it was and how beautiful the costumes ~ a fun evening!! Today was a gloomy, rainy day in Ohio. So, including pictures of the garden taken yesterday, when it was absolutely gorgeous outside, is a good way to put that all aside!! The garden is wild! As my husband would say "it's just like you!" Does that tell you anything?? The things I plant spread like crazy, jump from one side of the paths to the other, bloom voraciously, and create quite an interesting sight!! Maybe it is like me!!!!! Tomorrow is the beginning of the Garage Sale!!! If the number of trips I made hauling our "good stuff" up from the basement and down from the upstairs, is any indication of the success of the sale, it should be a whopper!!!!!! I really didn't give it a serious effort until yesterday and by tonite, I am whipped!! The garage is full and some of the "good stuff" will spill out onto the driveway tomorrow morning!! I forgot to note in my ad that there won't be any early sales ~ eee gadd ~ the serious folks will be here tomorrow morning at 7:30 !!! I hope they bring lots of money!! In all of the organization books, it always says that cleaning out the clutter brings more order to our lives!! I certainly hope that is true! The closets and the basement storage area have never looked so good ~ I'm excited ~ order in my life is just around the corner!! By the time I post again ~ all the "good stuff" should be gone and my pockets will be bulging!! I'll let you know. I do hope you all had the kind of Mother's Day that brought joy to your heart! We spent a long weekend at our place on Lake Erie ~ I like to call it the "North Coast" (as opposed to the East & West)!! We had fun with our lake friends and my husband got his spring chores done ~ power washing the decks before spider spraying! I watched ~ something I have down to a science! 'Mr. Catfish' rug went along and I did get some hooking time in! It's hard, though, because we're trying to have all the fun we can while we're there! I've included a progress photo which shows that the 'cat' part of Catfish is finished. I'm hooking this entire rug on a 9 cut and using an 8 for the lines of the cat and other details. It makes a rug move along faster, using that wide strip ~ and it would move especially fast if I spent more time at it! This rug is for our lake place ~ I intended it for a hallway that begs for artwork ~ but he might be too spectacular to relegate to the hall! We'll see how it goes when he's finished ~ yikes! I speak of this rug as though it's a person! Is it possible to get over-involved in your rug?? All in all, Mother's Day was a great one! We went to the Moose Club, which is right on Lake Erie, for breakfast with our friends ~ mother's eat free on Mother's Day! Then I hooked and watched Lifetime movies and we headed home late in the day. My son and daughter-in-law had dinner for us and her mom, and grandchildren gave me a half-moon plant hanger for the garden shed and homemade cards. My Seattle son and family sent flowers, another son and wife gifted me with giant chocolate-covered strawberries, and flower baskets were waiting on the porch when we returned from the lake! That was a bountiful Mother's Day ~ I am blessed! Thursday and Friday, I'm having a garage sale! I have an inordinate amount of 'really good stuff' that wants to go live with someone else! I'm cleaning out all the nooks and crannies and hauling all the wonderful saved stuff out of the basement and fill the garage with bargains! And the rule is ~ whatever is left cannot go back into the house! I'll let you know how it goes! And what a voyage ~ I typed an entire post ~ tried to add a picture ~ saved the post into a 'draft' and have spent the last hour trying to edit the draft and publish it!! I finally printed the draft so i could re-write it and deleted it altogether and am starting new!! I'm going to master this blog thing and not let it master me!! So here we go again ~ ~ ~ ~ By the way, this would be a typical DAY IN THE LIFE experience for me!! yikes!! Thanks to all of you who have sent comments and helped make me feel comfortable about doing this blogging thing! Today started out like a 'typical' day for me ~ I went to the hair salon for my 9:30 a.m. Wednesday every-three-week appointment and the only girl working said "what are you doing here?" Um ~ I'm here to get my gray hairs colored and cut ~ Your girl is on vacation, she replied!!!! Hm ~ ~ ~ I actually kind of knew that she was going to Florida but as it related to my hair appointment, it didn't compute. And she never said that I needed to reschedule this week because she wouldn't be there. The girl who was there kindly offered to do my hair later in the day, if I didn't mind coming back and I took her up on the offer. I guess my point in relating this dumb story is that years ago I would have reacted differently and not be very happy about being forgotten ~ but I'm learning that my reaction to a situation is what controls my feeling about it and that accepting the situation as it was, and blessing the fact that the other girl would take care of it ~ made it not a big deal at all!! I'm hoping to figure this all out before I leave this planet and I'm also hoping I've got a good long time to work on it!!! Last night, I only got about 40 minutes hooking time in on Mr. Catfish, so I really won't post that little bit of progress. But ~ I will show you a proddy sheep rug that my friend/customer did in a proddy class that I taught! She brought it over yesterday (which by now is really two days ago since it's nearly 1 in the morning) and she really did a great job on it! It's a pattern that I drew especially for proddy but it certainly could be a hooked sheep as well! Hopefully, I can add the picture successfully this time and instead of hooking tonite, I think I'll give in and say nighty night!! This is my first attempt at blogging ~ something told me that someone out there might be interested in what I had to say!! We'll see! I would like to add a picture of the rug I'm working on but I don't know how to do that yet!! 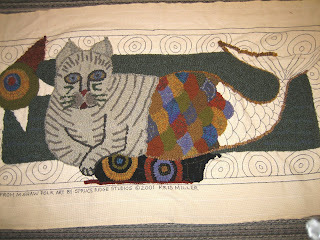 It's going to be such an interesting rug ~ "Catfish" drawn by Kris Miller, adapted from a Margaret Shaw painting ~ I've had it for several years but just took it with me to Barbara Carroll's to have her help in color planning it. It started out to look kind of wild in color but as we progressed the background and the border is settling it down and making it kind of dramatic. I can't wait for you all to see it!! I'm going to bite the bullet and publish this email and I will try to figure out how to include pictures!! Have a happy day! !